T-Pain Plots A 'Tiny Desk'-Inspired Acoustic Tour For This Fall Six cities. No Auto-Tune. All the hits. T-Pain is taking his voice, free of Auto-Tune effects, on the road. For nearly a decade T-Pain reigned, the ubiquitous King of Auto-Tune. A top-hat wearing ringmaster of tongue-in-cheek club anthems that celebrated his weakness for strippers and lady bartenders, the Tallahassee chart-topper personified the life of the party — until his vocal tricks became the punchline. Copycats rode his wave into the ground, then clowned the man synonymous with the sound. 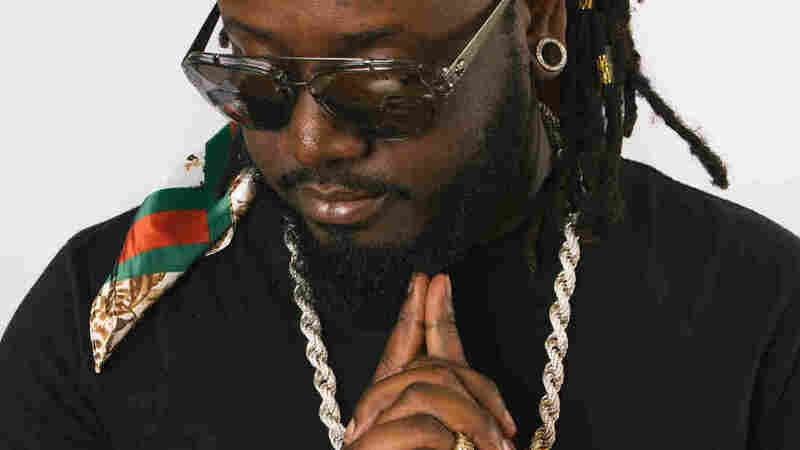 So T-Pain took some time away from the spotlight, only to reemerge sans Auto-Tune and shock the world. What we heard, when he unplugged for a stripped-down, three-song set in October 2014, was amazing. Not only could he sing, the man could sang. The resulting performance, spearheaded by former NPR Music staffer Frannie Kelley, became the most-popular Tiny Desk Concert in the history of NPR Music. For T-Pain, it felt like he'd finally proven a point. "For my whole career I'd been trying to convince people that I actually have a real speaking voice," he tells NPR. "So showing my singing skills on such a big platform was a huge accomplishment for me." Now, more than 10 million YouTube views later, he's converting that career-redefining moment into his first Tiny Desk-inspired Acoustic Tour. The six-city tour, where he plans to perform his most memorable hits in intimate, acoustic settings, launches in October, with dates scheduled for San Francisco, West Hollywood, Chicago, New York, Cambridge, and Washington D.C. Smino and Felly will open in select cities. The inspiration to turn his triumphant Tiny Desk set into a full-blown tour came from one source: "Fans, fans, fans," T-Pain says. "The love and respect I've received from my NPR performance has not only shown a different side of me to fans, but it also has introduced me to a whole different set of fans. All I see on social media is how all my fans want to see this in person, live, with their own eyes." His fans weren't the only ones who saw him in a new light. "Obviously there were a lot more offers for business opportunities that hadn't presented themselves in the past, and I think that it was mostly due to others not realizing my true talent," he says. But the 13-minute performance has impacted more than just his career. "It improved my health," T-Pain adds, explaining that his voice was hoarse and strained the day he did his Tiny Desk Concert. "I know for a fact that I could've sounded better that day if I hadn't been smoking so many cigarettes beforehand, and because of that I quit a week later and haven't touched a cigarette since. My heart problems have gone away. I feel great. I can breathe again. A lot came from this performance." The tour announcement comes on the heels of a tear of new music T-Pain has been releasing this year. He even unleashed the long-shelved collaborative album T-Wayne, featuring he and Lil Wayne, earlier this year. 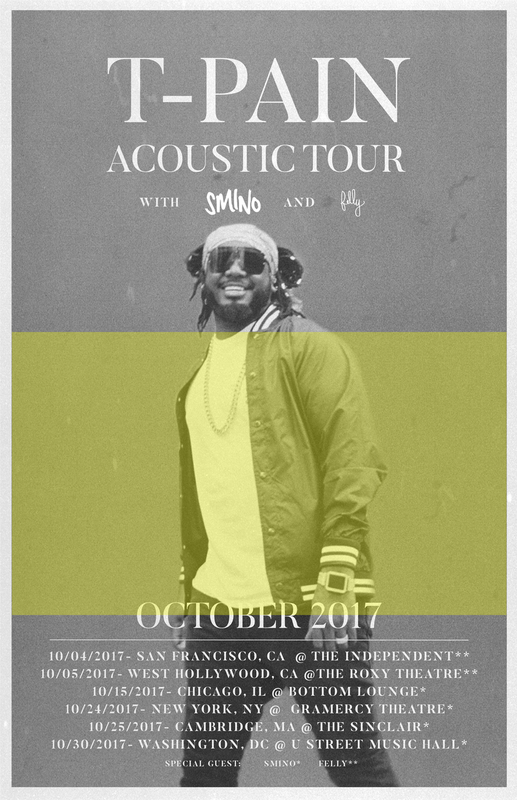 In addition to Acoustic Tour, T-Pain has plans to release a new album titled OBLiViON this fall. As for the concert dates, there will be no locked-in set lists. "Ya know, in case of people screaming requests from the audience," he says. The only thing he promises is that "the fans can expect a good time and nostalgia out the wazoo." Tickets go on sale Fri., Aug. 25 at 10 a.m. Visit tpaintour.com for more information.